It can be comforting to know that previous generations of students faced those very same questions, including one of the university’s most famous alumni, Herbert Hoover, who graduated in the pioneer class at Stanford in 1895. 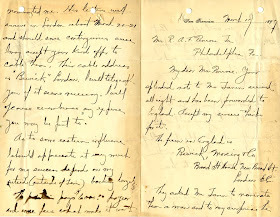 We can gain an intriguing look at the young Stanford graduate as he sought work as a mining engineer in the late 1890s, just a couple of years removed from his studies under the tutelage of geology professor John C. Branner, in the Hoover Archives’ R.A.F. 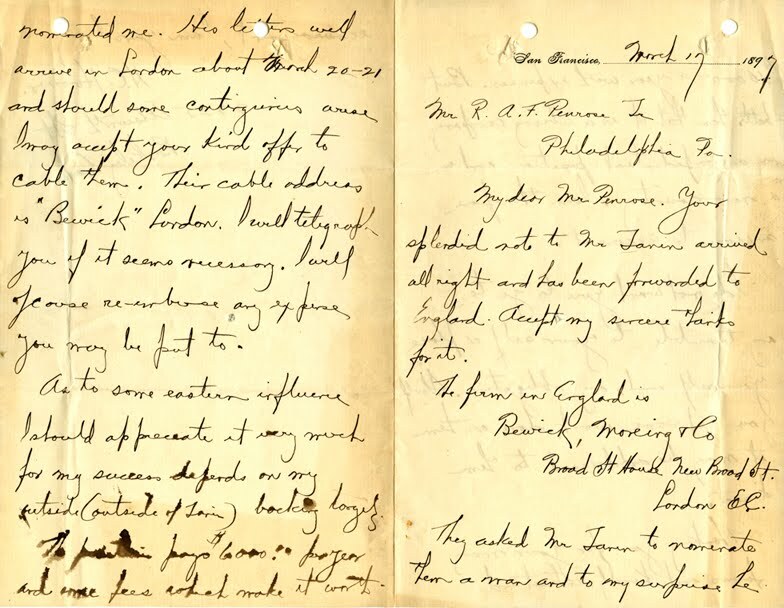 Penrose correspondence, which contains a number of early Hoover letters from such locales as Berkeley (yes, Hoover lived as a young Stanford graduate within a stone’s throw of that other university), Western Australia, and China. R.A.F. Penrose (1863-1931) was a professor of geology and a mining engineer who, among other accomplishments, surveyed the Cripple Creek gold claims in Colorado in the 1890s and later cofounded the Utah Copper Company, which developed one of the largest open-pit copper mines in the United States, at Bingham Canyon, near Salt Lake City. 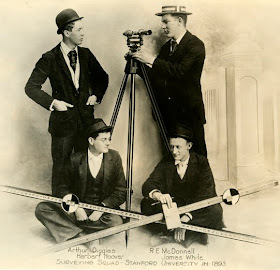 He also mentored younger geologists, many of whom went on to attain prominence in the field, such as Herbert Hoover, whom he presumably met when Hoover was an undergraduate at Stanford. 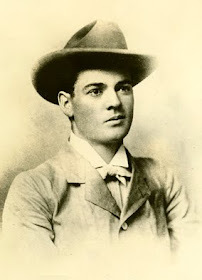 In Hoover’s first letter to Penrose, written from Berkeley on February 7, 1897, he sought Penrose’s help in obtaining a position as a surveyor of mines, discussing various options in the district of Randsburg, in the Mojave Desert of California, or in Prescott, Arizona. 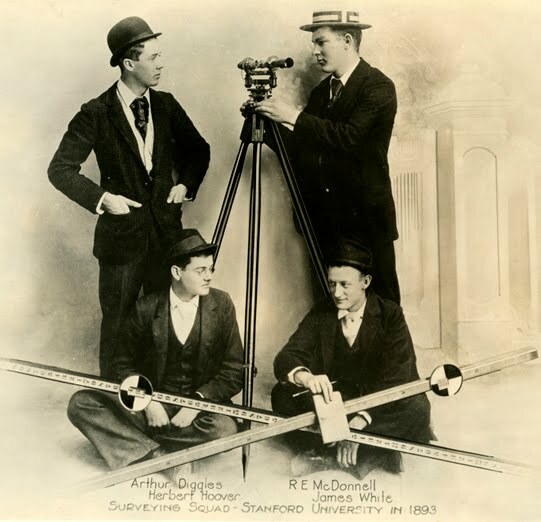 Hoover suggested he team up with a colleague named Means in that the two of them could do excellent work, surveying a mine in half the time that an individual geologist could and noting that “we both have very fine instruments” and that “we have both had considerable experience in all kinds of mine surveying,” adding that he (Hoover) also “had three of four jobs involving legal issues of importance and can therefore attend to matters of title, etc.” In reading this letter, we can imagine Hoover in the position of many recent college graduates, sending out letters of application and networking with mentors in his search for a suitable position. By April 12, Hoover had found success: he had been offered the position with Bewick, Moreing, noting in a brief letter written that day that he was being sent to Coolgardie, in Western Australia, with a salary of $5,000 (roughly equivalent to $100,000 in today’s dollars). 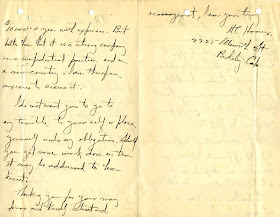 Hoover wrote to Penrose, “I desire to express my great obligations to you for the various kindnesses you have so freely extended and I hope I shall be able to vindicate your good opinions.” The rest, as they say, is history. Hoover’s position as a mining engineer in Western Australia led him to survey and discover several very profitable mines, such as the Sons of Gwalia, which in a few years earned Bewick, Moreing tens of millions of dollars and placed Hoover on the fast track to a successful career as the “doctor of sick mines,” and subsequently, as a well-known humanitarian, as the secretary of commerce, and, eventually, as the president of the United States. 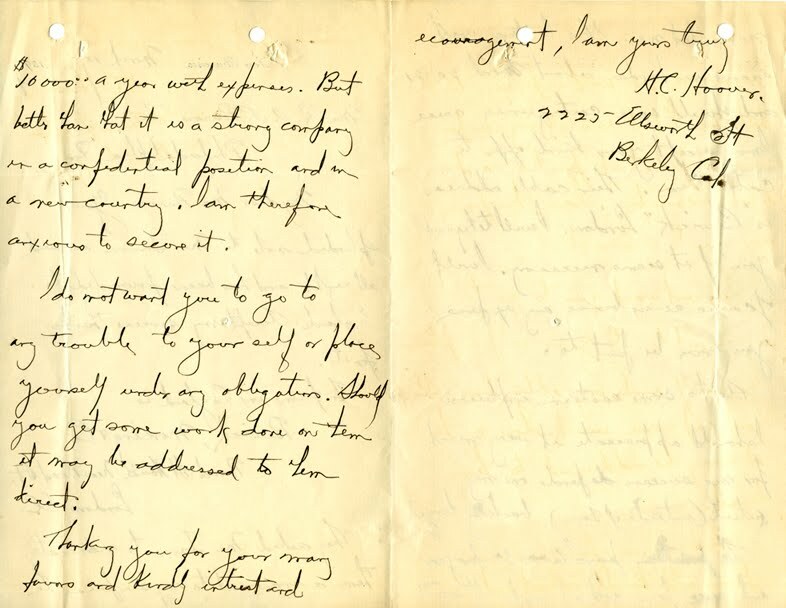 As these letters demonstrate—even in reading between the lines—Hoover’s path began in a manner similar to that of many college graduates: humble requests to respected mentors, dogged determination, countless application letters, and a few lucky breaks. In some respects, the experiences of this Stanford graduate of 1895 may not be so different from those of today’s graduates.